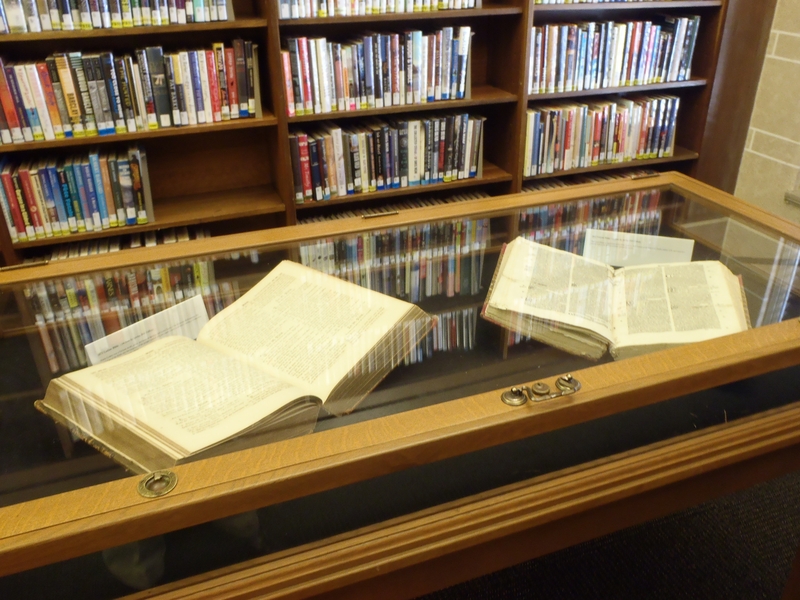 As part of the Mobile Public Library’s recent showing of the Manifold Greatness traveling exhibition, local residents and universities lent rare Bibles that were included in the display. 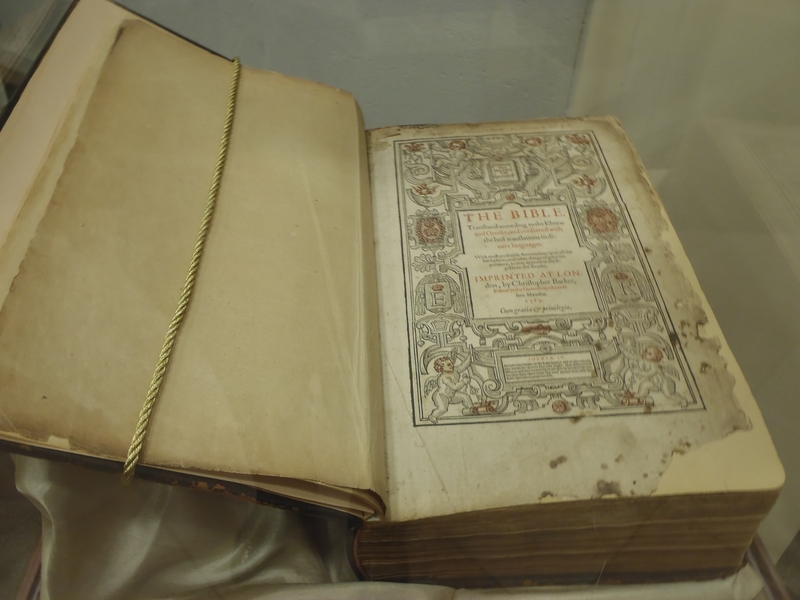 Mobile resident Robert S. Edington provided a 1583 Geneva Bible, which is also known as the “Breeches Bible.” “Breeches Bible” is a book collector’s term for the Geneva Bible, which was first printed 1560. The term derives from the reference in Genesis iii: 7 to Adam and Eve clothing themselves in “breeches” made from fig leaves. The Geneva Bible was one of the results of the persecution under infamous Queen Mary I, popularly known as “Bloody Mary” (1553-1558). Several of the Protestant reformers had fled to Geneva, Switzerland, to escape persectuion in England. Geneva was a free city, politically and religiously, dominated by Calvinism, the “cradle of the Reformed Faith” and a haven for religious reformists. 1583 Geneva Bible owned by Robert S. Edington. Also known as the "Breeches Bible," in reference to the Genesis iii:7 passage regarding Adam and Eve clothing themselves in "breeches" made from fig leaves. Photo courtesy of Mobile Public Library. 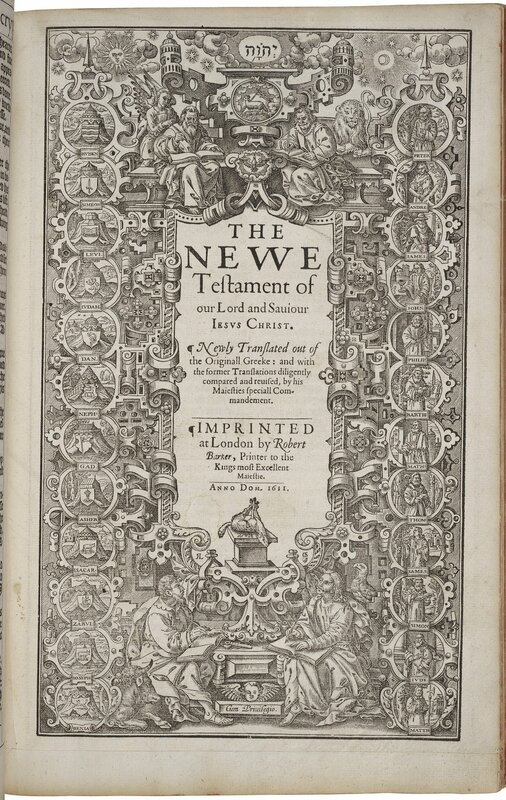 The Geneva Bible offered the first new English translation of the Bible in nearly 20 years. Many of the previous translations also had their inceptions under duress, such as William Tyndale’s work producing the New Testament at a time when English translations of the Bible were prohibited. Tyndale suffered execution as a result. For more information on the volatile history of English translations of the Bible, visit The Crown and the Bible on the Manifold Greatness website. 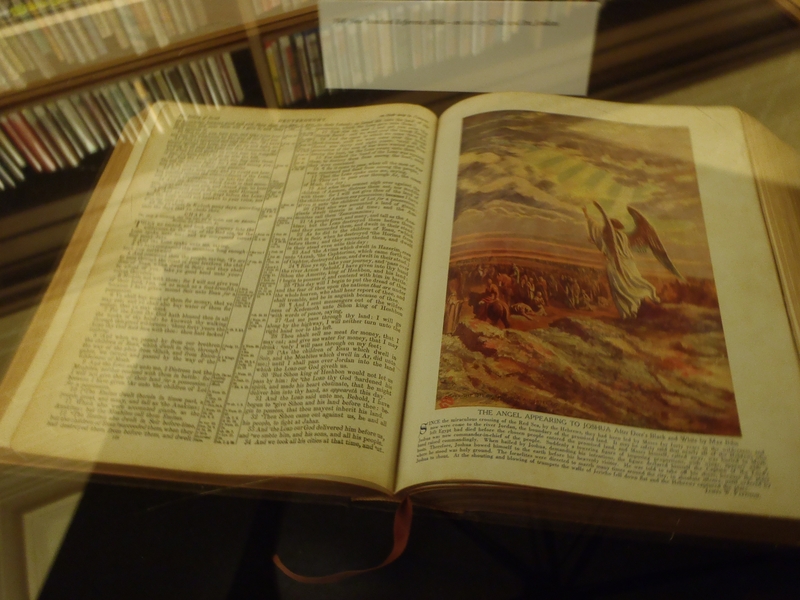 Spring Hill College contributed several Bibles to the exhibition, including a Gutenberg Bible facsimile that was produced in 1961. The Gutenberg Bible, known also as the Mazarin Bible and the 42-Line Bible, is a Latin edition of the Bible, printed at Mainz, Germany, sometime between 1450 and 1456. Although German bibliographers claim that it was printed by the German printer Johann Gutenberg, the edition may have been finished and perfected by Johann Fust, a wealthy financier who gained Gutenberg’s share of the business in a lawsuit; and Peter Schöffer, Gutenberg’s assistant. The book is the first volume known to have been printed with movable metal type. 1512 Vulgate Bible and 1871 Luther Bible on loan by Spring Hill College. Photo courtesy of Mobile Public Library. The College also provided a 1512 Vulgate Bible, a 1546 Hebraica Biblica (Hebrew-Latin Bible), and a 1871 Luther Bible. The Vulgate is a early translation of the Bible into Latin, originally undertaken in the 4th century. It remained the standard translation of the Bible for centuries, and was widely used throughout the middle ages. The Luther Bible is based on a translation by Martin Luther and was first published in 1534. Over 300 years later, his translation remained important enough for an edition to be printed in 1871. In addition, the University of Mobile lent several Bibles. Local residents Clyde and Ira Jenkins displayed their 1949 New Standard Reference Bible, and Robert Hyde showed his grandmother’s 1869 American Bible Society version. A family Bible owned by Clyde and Ira Jenkins. 1949 New Standard Reference Edition. Photo courtesy of Mobile Public Library. Amber Guy is a public relations officer at Mobile Public Library, which hosted the Manifold Greatness traveling exhibition from February 29 to March 30, 2012. The Holy Bible, conteyning the Old Testament, and the New: newly translated out of the originall tongues: & with the former translations diligently compared and revised, by his Majesties speciall commandement. Appointed to be read in churches. London, 1611. New Testament internal title page. Folger Shakespeare Library. Last week, Dr. Robert Alter, a professor of Hebrew language and comparative literature, spoke at the Harry Ransom Center at the University of Texas on translating scripture and the influence of the King James Bible. This interview originally appeared on the Harry Ransom Center’s Cultural Compass blog. In several interviews you have stated that you appreciate the King James Version. You have also created your own translations of many books of the Hebrew Bible. Are your goals in translating different from the King James Version translators’? For me, the power of the Hebrew Bible is inseparable from its stylistic virtuosity—its strong, compact rhythms; its expressive use of syntax; the subtlety and liveliness of its dialogue; the fine precision of its word-choices; the purposeful shifts of levels of diction. Though the King James Version often has its own stylistic beauty (though not as consistently as people tend to remember), the 1611 translators paid attention to none of these considerations and probably were unaware of most of them. Their goal was to provide as exact an equivalent as they could, according to their own understanding, of each word in the original. I share their commitment to a certain literalism but as part of a tight weave of stylistic effects in the Hebrew. In your book Pen of Iron you examine the influence of the King James Bible on famous American writers such as William Faulkner and Herman Melville. Do you see the same influence in the work of any contemporary American writers? Fewer American writers now, for rather obvious cultural reasons, are drawing on the King James Version, but its influence has far from disappeared. Two contemporary novelists I discuss in Pen of Iron who reflect the language of the King James Bible are Marilynne Robinson and Cormac McCarthy. Another is the late Barry Hannah. With so many new translations available, is the King James Version still important and relevant today? Translations that cast the Bible in up-to-the-minute American English are definitely cutting into the constituency of the King James Version because they are easier to read and seem more “accessible.” My own sense is that such translations lack any literary grace and distort the feeling and the meaning of the Bible. Though we are distanced from the 1611 version now because of its archaic language, its beauty is undiminished, and I think it will always have readers as a great literary achievement that altered the course of the English language. Kelsey McKinney is an undergraduate intern at the Harry Ransom Center and a regular contributor to the Cultural Compass blog. 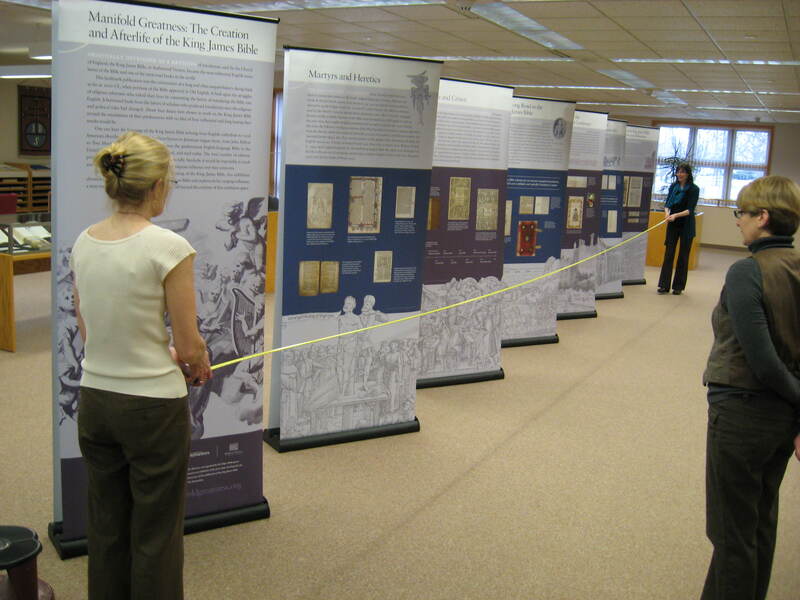 The King James Bible: Its History and Influence, a companion exhibition to Manifold Greatness: The Creation and Afterlife of the King James Bible, is on view at the Ransom Center until July 29, 2012. Kari Miller Fenwood demonstrates a technique for cleaning old books. Courtesy of Hope College. Photo by Kelly Jacobsma. 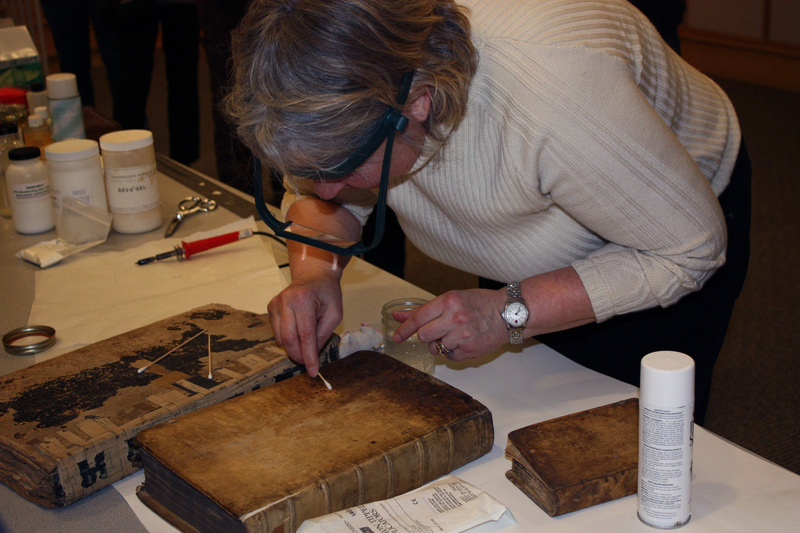 Hope College recently hosted a workshop on the care and restoration of family Bibles and other rare books. Kari Miller Fenwood, of Kari Miller Restoration, spoke about the complexities involved in book restoration due to the variety of materials involved. She demonstrated several restoration techniques, and offered tips on how to properly care for old books. Eliminate care of dust and other surface contaminates by vacuuming. Using a vacuum with a HEPA filter is preferred. When placing newspaper articles, flowers, leaves and other materials into a book, protect the page with glacine or other archival paper. Store books away from direct sunlight. Control moisture levels as much as possible. The guidelines for furniture apply to books – make sure the environment is neither too damp nor too dry. When doing repairs at home, be sure to use archival-quality materials. DO NOT use scotch or masking tape to repair tears. Before making any repair, clean the surface of the page with a dry cleaning pad intended for documents. If books are badly damaged or deteriorated, store them in acid-free boxes, or wrap them in acid free paper. This will help to protect them from further damage. You may wish to consult a conservator to determine the best course of action for books that are valuable and/or meaningful. For more information on caring for family Bibles or heirlooms books, two excellent resouces include Your Old Books, a guide sponsored by the Rare Books and Manuscript Section of the Association of College and Research Libraries, and the Care, Handling and Storage of Books webpage from the Library of Congress. This workshop is part of a series of lectures and workshops offered throughout March as part of the Manifold Greatness traveling exhibition at the Hope College Van Wylen Library. Approximately 40 people attended the hands-on workshop, which also included demonostrations on cleaning and repairing several items from the Hope College Rare Book Collection. Kelly Jacobsma is Director of Libraries at Hope College. Manifold Greatness at Hope College. Photo by Kelly Jacobsma. Courtesy Hope College Libray. The Manifold Greatness traveling exhibition opens today at Hope College in Holland, MI and will be on view in the Van Wylen Library. In addition to an opening reception, lectures, and other public programs, Hope College will also display items from the library’s rare book collections. Read more about Manifold Greatness at Hope College on the Hope College Libraries blog, Common Knowledge.